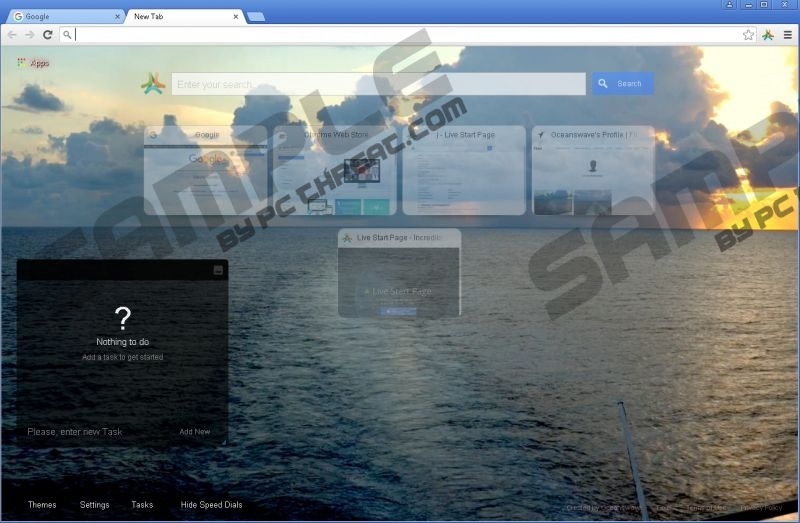 People who install Live Start Page – Living Wallpapers from the Chrome Web Store might notice the presence of ParallaxSearch.com when they open a New Tab page. We also cannot deny the possibility that the extension has been added to your Google Chrome browser without permission too. Those people who download Living Start Page – Living Wallpapers consciously, they do that mainly because this software says that will provide up-to-date weather information, it will work as an organizer, it will enable users to access their most frequently viewed web pages, and it will allow them to change the theme of their browsers. The application cannot be considered to be malware; however, many users find the presence of ParallaxSearch.com really annoying. If you get rid of Live Start Page – Living Wallpapers extension, ParallaxSearch.com search engine will not be seen on Google Chrome browser anymore. Actually, it might be a rather good idea to get rid of ParallaxSearch.com because this search engine is definitely not that useful as Google, Yahoo! or Bing. There is even a possibility that you will see advertisements at the top of your search results if you decide to use it to search for the information. In most cases, they will have a label “Ads related to: [your keyword],” so it might not be a problem to recognize them if you are very attentive. Unfortunately, the majority of users are not careful, which means that they click on these advertisements. Research carried out by the specialists working at pcthreat.com has shown that these ads might take you to unreliable web pages. Of course, they advertise decent websites, e.g. the official web page of WalMart, too, but there might still be some ads that promote unreliable web pages. Therefore, we suggest that you start to use another search engine to find the information on the web. Specialists say that there is a possibility that Live Start – Living Wallpapers, which is responsible for the presence of ParallaxSearch.com, travels bundled too. It means that you might encounter ParallaxSearch.com even if you have not installed the extension it comes with yourself. There is a possibility that this extension has entered your system together with other suspicious applications, and you should find out whether or not it is true. Delete those untrustworthy programs if you detect them and do not forget to install a security tool on your PC to prevent undesirable software from slithering onto your computer. The extension which is responsible for the presence of ParallaxSearch.com search engine is compatible with Google Chrome only, so you will just need to remove the extension in order to restore the changes which have been applied to your browser. You can use our instructions for this matter. If you do not have time for this, scan your system with an automatic antimalware tool. There is a really wide choice of such tools, but we still suggest using the SpyHunter antimalware scanner because this tool is really powerful and it will eliminate all the existing threats in the blink of an eye. Open More Tools and open Extensions. Find and select the unwanted extensions. Quick & tested solution for ParallaxSearch.com removal.